Please review the additional Customer Help Center pages & document for additional information about how to submit your electronic files. We strongly recommend using a professional quality page layout program such as InDesign or QuarkXPress for creating your page layouts. All pages are to be built to the actual final trim size of your magazine. For instance: if your final publication size is 8 3/8″ x 10 7/8″ your document size in your page layout program should also be 8 3/8″ x 10 7/8″. 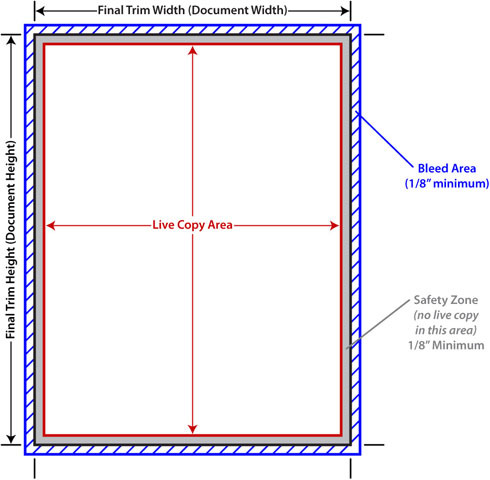 All bleeds should exceed the final trim size by a minimum of 1/8″. All copy for perfect bound publications should be kept a minimum from 3/8″ from spine (5/8″ from spine for inside cover, inside back and first and last text pages). Type over white or light backgrounds should be black or very dark. Type over black or dark backgrounds should be white or very light. To maintain quality, black text should be a minimum 6-pt sans serif medium font. To maintain quality, reverse type should be a minimum 8-pt sans serif bold face font. To maintain quality, overprint type should be a minimum 6-pt sans serif bold face font. Century Publishing recommends using reliable, quality fonts, such as those available from Adobe and Linotype. Many inexpensive and free fonts, such as Google fonts, are often intended for low resolution work, such as web design, and prove unreliable for high resolution output. Low cost fonts may look good on the screen of a computer, tablet or smart phone, but do not embed properly in PDFs and do not render as intended when output in high resolution for a commercial printing press. Line work scans should have a minimum effective resolution of 600 dpi. Convert images to CMYK color mode using UCR, with a maximum density of 300%, and a maximum black of 85% or specify “U.S. Web Coated (SWOP) v2” as CMYK profile prior to converting from RGB to CMYK. For rules and lines specify line thickness to maintain consistency. The use of “hairline” rules or lines should be avoided.